Based in the Chicago region, Nalco-owned Crossbow Water has been serving the Central region with customized industrial water solutions for over 40 years. At our Glenwood facility, we own and operate a major deionization regeneration plant and DI exchange services facility large enough to satisfy the needs of the Central region. We rent, sell, service and maintain a full line of water treatment equipment including: deionization; reverse osmosis; softening; iron filtration; depth filtration; ultra-filtration; ultra-violet sterilizers; automated controls; and more. 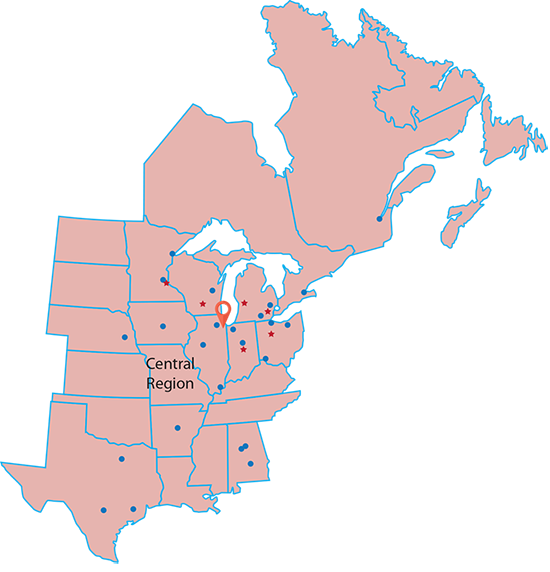 From our resin regeneration and DI exchange services facility in Illinois and six regional service centers in Ohio, Michigan, Indiana, Wisconsin, and Minnesota, we provide exchange deionized water service for the Central region.